Hold the phone, I spoke too soon. I recently wrote that the best part of the MTV Movie Awards was the trailer for Catching Fire. I honestly thought this until I learned that the Aubrey Plaza appearance during Will Ferrell's Comedic Genius Award acceptance speech was NOT planned. 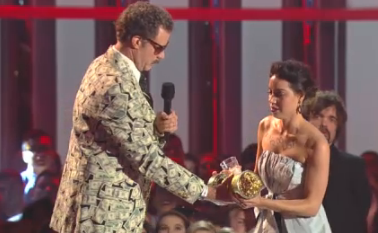 Obviously you can understand why I just assumed the whole thing was part of Ferrell's weird acceptance speech...he also brought up an Asian family and an Indian kid and said it was his wife an children. The man is a nut, so someone walking up on stage and trying to take his award away was not too far fetching in my mind. MTV confirmed that the stunt was not part of his shtick and producers asked her to leave the show after she got off stage. The actress, most notably from Parks and Recreation, had # The To Do List written across her chest in sharpie. The To Do List hits theatres this summer. I will go see it because...well, great balls woman, that was quite the gorilla marketing ploy! will ferrell is the complete opposite of "comedic genius." he is simply not funny. the part where he brought a fake asian family on stage was extremely racist. millions of asians struggle in poverty, trying to make a life for themselves. I can't believe he actually did this. is this the best he can come up with? in all honesty, it was pathetic. not only was it racist and insensitive, but it was very unoriginal too. it was not creative, it was not clever. it was so stupid that it made the whole thing uncomfortable and awkward. somebody needs to tell will ferrell that he is a cheap racist hack. he should be ashamed. if you want real comedic genius watch the younger generation because will ferrell is out of his mind. he is just an old racist white man.